What are the best girls rolling luggage? Whether for school or for travel, you ought to buy your child a rolling luggage to help ease the difficulty of having to carry so much. Why not lug your belongings with wheels instead of carrying it behind you? It will lessen the effort you exert, giving you more energy to do more important stuff. This is especially the case if you’re out for a travel. You want to conserve energy as much as possible to visit more, and do more. Which rolling luggage for girls should you pick? This luggage is kids entering kindergarten or preparatory school. It is perfect for their small frames and at the same time, it is big and spacious enough for all the belongings they need to take with them to school. Books, envelops, notebooks, packed lunch, and small school supplies can fit in it just fine. PROS: This rolling luggage comes in five adorable designs that will really excite your daughter. Take her shopping with you so she can choose the design she wants. Pick from the pastel pink, violet, and green colors with matching butterfly, ladybug, owl, and flower appliques. The height of the handle can be adjusted according to your child’s height, the maximum is also quite tall, so you can rest assured that your daughter will not outgrow her bag. It is made of 100% nylon that can be easily hand washed. It has mesh pockets in front and on both sides to hold your child’s packed lunch/snack, as well as water and juice bottles. The zippers are sturdy and won’t break easily, as well as the two back wheels that can carry the weight of your child’s bag with ease. CONS: Although the zipper is quite sturdy, it doesn’t slide smoothly and is prone to get stuck. When this happens, users tend to pull harder which causes the zippers to eventually break. Of all the parts of this rolling luggage, the zipper is definitely its weakest point. Front pocket on luggage and on backpack is an insulated snack cooler, ideal for snacks on the go! This rolling luggage is bigger than the previous one reviewed. 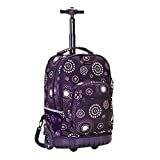 This is suited for girls who enter first grade because it’s quite roomy and great for lugging books and other heavy school supplies. This bag is perfect for both school use and travel use because it is sturdy enough to hold its shape and protect the belongings inside. This product comes in ten designs for both boys and girls. PROS: The front pocket is insulated and is considered as a snack cooler, ideal for storage of your child’s packed food. There are also two mesh pockets on the side to hold your child’s water or juice container. Inside the main compartment, there’s a garter that will effectively hold your child’s books or clothing in place. There’s also an inner mesh pocket that can hold important papers and documents. The handle is sturdy and can be adjusted according to your daughter’s height. The pair of stand in front is made of durable plastic as well as the wheels. It rolls quietly and swiftly; you don’t have to exert too much effort with pulling it behind you, as it slides like a dream. CONS: The fabric, although thick and durable, is not considered as luggage quality. 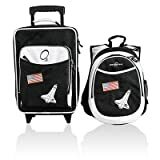 If you intend to use it daily for school, it will work great, however, if used excessively for travel where it will be on the go for hours at a time or thrown at the airplane storage, it might not last that long. Consider getting a heavy duty luggage for this purpose. This luggage is meant for girls that are older than eight. This is a bit bigger and heavier than the previous products reviewed. It is made of heavy-duty polyester material that is suitable for use at school or for travel. It has an aluminum single bag handle that can be adjusted according to preferred height and comes in four designs: Bandana, Black Dot, Pink Pearl, and Purple Pearl. PROS: This rolling luggage for girls is very stable because of its rubber/plastic support at the bottom. You don’t have to worry about it turning over because the weight is evenly spread between the two front stand and pair in line skate wheels. Inside, it’s very roomy and can fit books, binders, folders, and notebooks with ease. The interior also comes with a built-in laptop compartment that is padded to protect your machine from bumps. It has three generous pockets outside that help you organize your stuff more. The front-most pocket can be used as a lunch kit as it is insulated. This way you don’t have to bring a separate bag for your food. Place water bottles or drink canisters at the mesh compartments located on each side of the luggage. CONS: The zippers tear off quite easily as written by owners in their negative reviews. Most of the important parts of the bag, like the aluminum handle and the wheels are irreplaceable so if any of these breaks, this luggage is unusable anymore. Also, the bag can transform into a backpack (it has built-in straps) but these are quite weak and users suggest using it only during emergency purposes like when it rains. The stitches on the straps are quite weak and it tears off easily. If you’re going to purchase a rolling luggage for girlss online for good deals, make sure to check the bag first physically in a store to see if it is the right size, if it’s sturdy and durable enough, and if it fits the needs of the one who will use it. Sometimes photos and descriptions are not enough and it’s more difficult to return an item when bought online. Make sure that you’re sure with what you’re buying to save you money in the long run, as you don’t have to always purchase replacements or pay for repairs.